The latest Pixar film speeds to both formats this November. In an early announcement to retailers, Disney/Buena Vista is preparing 'Cars 3' for a Blu-ray and Ultra HD Blu-ray release on November 7. 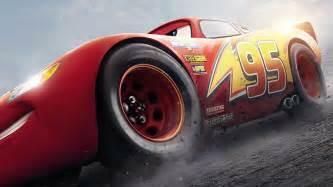 Cars 3 features Owen Wilson (“The Royal Tenenbaums,” upcoming “Wonder”) as the voice of Lightning McQueen. Cristela Alonzo (“The Angry Birds Movie”) voices tech-savvy trainer Cruz Ramirez, who tries to help #95 return to greatness, and Armie Hammer (“The Birth of a Nation”) lends his voice to next-gen racer Jackson Storm, whose high-tech speed leaves Lightning McQueen behind. Kerry Washington (ABC’s “Scandal,” HBO’s “Confirmation”) was called on to voice statistical analyst Natalie Certain, Nathan Fillion (ABC’s “Castle,” ABC’s “Modern Family”) provides the voice of brilliant businesscar Sterling, Lea DeLaria (Netflix’s “Orange is the New Black”) lends her voice to formidable school bus Miss Fritter, and Formula One driver Lewis Hamilton helps bring voice command assistant Hamilton to life. You can find the latest specs for Cars 3 linked from our Blu-ray Release Schedule and 4K Release Schedule where it is indexed under November 7.